RARE Colonization Society of the State of New-York membership certificate issued to William Douglas. This item has a vignette of African Americans on the beach praising a white man in a top hap with a ship in the background. This item has been hand signed by Anson Green Phelps as President and Daniel Lynn Carroll as Executive Secretary. Professionally mounted to canvas, long ago, to preserve the fragile paper of the document. Undated but issued no later than 1839 based on the William Douglas' death. Some soiling. 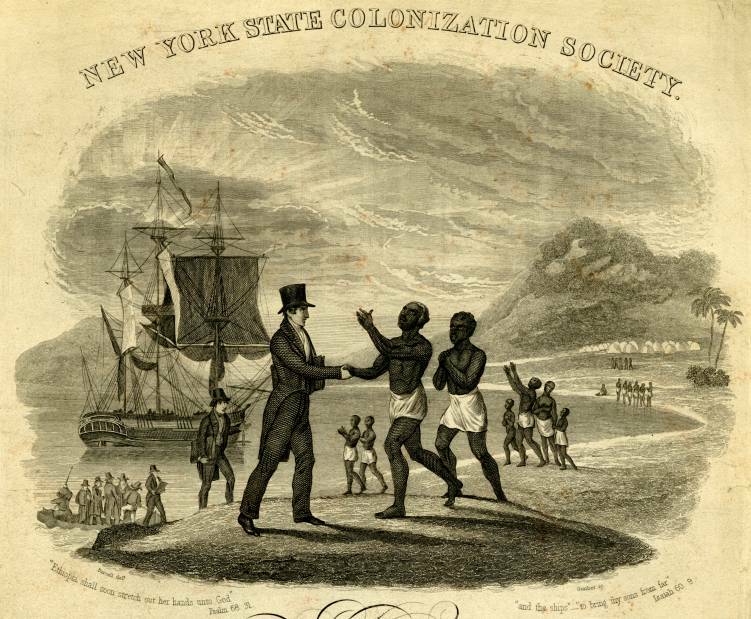 The New-York State Colonization Society was organized in 1829 to aid the American Colonization Society to colonize free blacks in Africa; subsequently the New-York State Colonization Society was reorganized and assisted those who offered to emigrate to Liberia. Beginning in the late nineteenth century the society supported educational and health related institutions in Liberia and funded scholarships. Some of the organizations and institutions funded are: Liberia College, Booker Washington Agricultural and Industrial Institute (modelled after Tuskegee Institute), Cuttington College and Divinity School, Samuel Grimes Maternity and Child Welfare Center and Mount Coffee Experimental Farm. The Colonization Society also granted scholarships to Liberian men seeking advanced training in skills useful to Liberia. The New-York State Colonization Society was dissolved in 1968 and its assets transferred to the Phelps-Stokes Fund, a foundation sharing similar purposes. Anson Green Phelps (March 24, 1781 � November 30, 1853) founded Phelps, Dodge & Co. in 1833 with his sons-in-laws William E. Dodge and Daniel James as partners. His third son-in-law - James Boulter Stokes - would become a partner some years later. Born in Simsbury, Connecticut in 1781, his mother died when he was 12 years old, after which he was raised in the house of the minister of Simsbury. He was descended from the early American Colonial Governors Thomas Dudley, John Haynes and George Wyllys. On 13 October 1799, he chose Thomas Woodbridge Phelps as his guardian. On 5 May 1799, Thomas Woodbridge Phelps and Anson Green Phelps were admitted to the Congregational Church in South Canton, Connecticut led by Reverend Jeremiah Hallock. In his early adulthood, he left Simsbury and settled in Hartford, Connecticut. After moving to Hartford, Phelps began manufacturing saddles and shipping them to the South. His business grew rapidly and he was able to build a large brick building on North Main street that became known as the "Phelps Block." In 1812 he moved to New York City and began doing business with Elisha Peck under the firm name of Phelps, Peck & Co. in America and Peck, Phelps & Co. in Liverpool, England, from where Peck operated. They dealt in metal imports from England including tin, tin plate, iron, brass, and exported cotton to the mills in England. Fellow businessman Sheldon Smith persuaded Phelps to invest in the growing town of Derby, Connecticut, in an area that came to be known as Birmingham. Unable to grow his business in his efforts to expand his business farther north, Phelps instead selected a location on the east bank of the Naugatuck River in what is now downtown Ansonia. Ansonia was first settled in 1652 and named in honor of Anson Phelps. The state chartered Ansonia as a borough of Derby in 1864, and later as a separate town in 1889. In 1893, Ansonia incorporated as a city, consolidating with the boundaries of the town. Phelps' business continued to prosper and he accumulated a large fortune. His original partnership with Peck was dissolved in 1832 following the destruction of their New York warehouse (4 May 1832) due to structural failure. Phelps and his son narrowly escaped, but among the dead was Josiah Stokes, a senior clerk who was betrothed to Phelps daughter, Caroline. This was a terrible blow to Phelps and he had to reorganize the business, forming the Phelps Dodge Company in 1833 with his son-in-laws William Earl Dodge and Daniel James as partners. In 1839 Phelps made his son, Anson G Phelps Jr. a partner with a one eight share of the business. Caroline Phelps eventually married James Boulter Stokes, brother of the dead Josiah, and he would became the 3rd son-in-law to join Phelps, Dodge & Co. as a partner. Stokes was wealthy in his own right, and during the 1837 financial crisis helped the Phelps, Dodge partnership through a difficult time with a loan. Phelps business interests included banking, property, mining, ironworks, shipping, railroads and timber. After the split with Peck some of these interests were divided between the two men, although others remained in joint partnership, including the New York property portfolio and shipping. Peck, who took over the rolling mill at Haverstraw, would continue to purchase raw materials from Phelps. Phelps continued to be an active member of the Congregational Church, and he took an interest in a number of philanthropic causes. He contributed heavily to the American Bible Society, the American Board of Commissioners for Foreign Missions, the American Home Missionary Society, the Colonization Society, the Blind Asylum of New York City, and served as the president of each at some point during his life. He also contributed to many other societies and charitable institutions both while he lived and in his estate. He gave his native town of Simsbury, Connecticut US$1000 to aid the poor. Among his other philanthropic activities was the creation of the Anson G. Phelps lecture series on early American history at New York University. In the 1830s, Phelps supported Presbyterian preacher Charles Grandison Finney during his ministry in New York. Phelps first hired a church for him in Vanderwater St., and later purchased a church in Princes St., near Broadway. Finney was "much struck with the piety of Mr Phelps", and said that Phelps would rise at night so that he could communion with God, having little time for secret devotion during the day, when business pressed him. Anson married Olivia Egleston, daughter of Elihu and Elizabeth Egleston, on 26 October 1806. He and Olivia had nine children: Elizabeth, Melissa, Caroline Olivia (died in infancy), and Caroline, all born in Hartford, Connecticut; and Harriett, Anson Green Jr., Olivia Egleston, and Lydia Ann, all born in New York City. His grandsons included Anson Phelps Stokes and William Earl Dodge Stokes, and a great-grandson, a well-known philanthropist also named Anson Phelps Stokes. � I give and bequeath to each of my grand-children, living at my decease, the sum of $5,000, to be paid them as they severally attain the age of 21 years. This latter bequest I direct to be accompanied by my executors with this injunction:-That each of my said grand-children shall consider the said bequest as a sacred deposit, committed to their trust, to be invested by each grand-child, and the income derived therefrom to be devoted to spread the gospel, and to promote the Redeemer's kingdom oil earth, hoping and trusting that the God of Heaven will give to each of that wisdom which is from above, and incline them to be faithful stewards, and transmit the same to their descendants, to be sacredly devoted to the same object. He was buried in his family vault in the New York Marble Cemetery, and was later re-interred in the Green-Wood Cemetery. Daniel Lynn Carroll was born in Fayette county, Pennsylvania, on May 10th, 1797. After surmounting great obstacles to his education, he was finally able to graduate from Jefferson College in 1823, at the age of twenty-six. He then enrolled at Princeton Theological Seminary and took the three-year curriculum, staying for another six months of study after graduation. Of Mr. Carroll, Archibald Alexander said that he was one of his finest students. Seeking a call, he was installed as the pastor of a Congregational church in Litchfield, Connecticut in October of 1827. Then early in March, 1829, he accepted a call from the First Presbyterian Church in Brooklyn, Long Island, though this pastorate ended in 1835, due to a severe throat ailment. Almost immediately he was appointed to serve as the President of the Hampden-Sydney College in Virginia. Carroll, unknown to most at the school, was elected to the position almost entirely on the testimony of one old friend who was among the College�s trustees. His term here too was relatively brief, with Rev. Carroll resigning over what was described as �some theological difficulties.� Without further investigation, it appears that Rev. Carroll may have been a New School man, and thus his problems. Upon his resignation from Hampden-Sydney, Carroll accepted a call to the First Church of the Northern Liberties, a section of Philadelphia. This was the church where the Rev. James Patterson had ministered so effectively and the region where Patterson had evangelized so fervently. To have followed a beloved pastor like Patterson and done so with success, speaks well of Rev. Carroll and his abilities. Carroll remained at First Church until 1844, when declining health forced his retirement from that pulpit. After a brief tour of service for the Colonization Society, he died, in Philadelphia, at the age of fifty-five, on November 23, 1851.As a preacher,, Dr. Carroll was quite popular, and often preached to crowded churches. He had a refined taste, a lively imagination, and a careful organization in all that he did and said. He excelled at the pulpit. Two volumes of his sermons were published, along with some topical discourses issued separately.Dr. Carroll also contributed an introduction and a chapter to the Memoir issued upon the death of the Rev. James Patterson. Carroll�s chapter from that book focused on field preaching, an activity which characterized Rev. Patterson�s ministry. "We are prompted by the sacred ties of friendship to pay a brief tribute to the memory of one who was lost by the wreck of the packet ship Pennsylvania; we allude to William Douglas, Esq., of this city. Mr. Douglas was a native of Scotland; he came to this country early in life, soon became a partner in one of the first mercantile houses in New York. Faultless as a companion � a friend, and a husband � generous and manly in all his transactions with others, it may with truth be said, he never made an enemy. Cut down in the prime of existence, the news of his untimely death brought with it no ordinary pangs to the bosoms of a large circle of friends ; and in the heart of one, united to him by the nearest and dearest connexion of life, the melancholy tidings opened a wound, which time itself, with its soothing influence, can never entirely heal. He has gone through death's sleep unto God- � the best of friends, and an honest man." FORMATION OF NEW-YORK STATE COLONIZATION SOCIETY. Consistory Rooms of the Refd. Dutch Church, New-York, May 8, 1839. Resolved, That the convention consist of all those persons who present their credentials as delegates from the different parts of the State, and also that those friends of the cause present, who are without written credentials, be invited to participate in the deliberations and doings of the convention. Whereupon, a highly respectable number of delegates, from different parts of the State, presented themselves, and were enrolled as members. Resolved, after a free expression of views on the subject, That, in the opinion of this convention, the cause of Colonisation will be advanced by the formation of a State Society�as thereby the views of its friends may be more fully communicated to each other, and their more efficient co-operation secured. Resolved, That a committee of six be appointed to prepare and report a constitution for a State Colonization Society. Rev. Dr. Spring, Rev. Mr. Copp, Dr. Reese, Rev. Mr. Hough, Rev. Mr. Chase and Rev. Mr. Burtis were appointed that committee. Convention then adjourned, to meet again, in this place, at 6 o'clock, P. M. Closed with prayer by the Rev. Mr. Pinney. 6 O'clock, P. M. Convention again assembled, and proceeded to business. 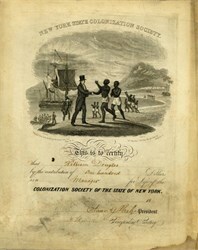 CONSTITUTION OF THE NEW YORK STATE COLONIZATION SOCIETY. Art. 1. This Society shall be called the New York State Colonization Society, and shall be directly connected with the American Colonization Society, on the principles of its constitution. Art. 2. This Society shall be located in the city of Albany. Art. 3. Any person may become a member for life of this Society by the payment of thirty dollar. ?, or a manager by the payment of one hundred dollars, or a patron by the payment of one thousand dollars; and the President of any local Society, auxiliary to this Society, shall be ex-officio a manager of this Society. Any individual may become a member of this Society by contributing any sum to its funds annually. Art. 4. Any minister of the gospel may become a manager for life by the payment of fifty dollars. Art. 5. The officers of this Society shall be a President, Vice Presidents, and thirty Managers, a Corresponding Secretary, a Recording Secretary, and a Treasurer; of which� Board, when regularly convened, seven shall form a quorum. The President, Vice Presidents, Secretaries and Treasurer shall be ex-officio members of the Board of Managers. Art. 6. The Board of Managers shall meet, on their own adjournment, to transact the business of the Society; and the first meeting shall be on Monday, the 13th inst.at 10 o'clock, A. M., in the city of Albany, at the session room of Rev. Dr. Sprague's church. Art. 7. The Treasurer shall keep the accounts of the Society, shall take charge of its funds, and hold them subject to the order of the Board of Managers. Art. 8. The Corresponding Secretary shall conduct the correspondence, under the direction of the Board of Managers ; and the Recording Secretary shall keep the minutes of the Society, and of the Board, and give notice of all meetings. Art. 9. There shall be an Executive Committee, consisting of seven members, appointed annually by the Board of Managers, from their own number, whose office it shall be to transact the ordinary business of the Society, and report to the Board of Managers an account of their transactions�four of whom shall constitute a quorum; and the Corresponding Secretary shall be ex-officio a member of this Committee. ..
Art. 10. The patrons and managers for life of this Society shall be ex-officio members of the Board of Managers, dan shall be entitled to meet with the Board, and unite in the discussion of any subjects presented to them, but not to vote. Art. 11. The officers of this Society shall hold their places for one year, and until their successors are duly chosen. Art. 12. This Society shall hold its annual meeting at such time and place as the Board of Managers may direct, to receive the annual report and elect officers; it may also hold occasional meetings in other places throughout the State, as the Board of MaBagers may authorize. Art. 13. The Board of Managers shall have the power of filling all vacancies in their own body; and if any member is absent from three meetings in succession, without a satisfactory reason, the Board may pronounce his seat vacant. Art. 14. This constitution shall not be altered, except at an annual meeting �f the Society, and by a vote of the majority of the members present. Oil motion, Resolved, That Rev. Moses Chase, Anson G. Phelps, Esq., and Rev. Dr. Proudfit, be a committee to nominate the officers of the State Society, and that they report to-morrow morning, at 9 o'clock, in this place. Convention adjourned till to-morrow morning, at 9 o'clock. Thursday Morning, May 9, 1839. Convention assembled in the consistory rooms of the Reformed Dutch Church, pursuant to adjournment, and was opened with prayer by the Chairman. President�Hon. Archibald Mclntire. Vice Presidents�Wm. P. Van Rcnssalaer, Esq., Hon. David Buel, Hon. Asa Fitch, S. Newton Dexter, Esq., Rev. Nathaniel Kendrick, D. D., James Pumpelly, Esq., Hon. Jacob Sutherland, Nath'l W. Howell, Esq., Harvey Ely, Esq., Herman Camp, Esq., Hon. Samuel Nelson, Wm. M. Oliver, Esq., Albert Porter, Esq., Rev. Mr. Shelton, Isaac W. Boslwick, Esq., Hon. John Fine, Isaac C. Piatt, Esq., Hon. Edward Howell, Hon. Reuben H. Walworth, Hon. A. Loomis, Hon. N. P. Tallmadge, Hon. T. Robinson, Hon. Erastus Corning, Hon Hiram Denio, Hon. Henry a Foster, Rev. Eliphalet Nott, D. D., Rev. Simeon North, Pres'tof Hamilton College. Corresponding Secretary�Rev. Isaac N. Wyckoff, D. D. Recording Secretary�Gideon Hawley, Esq. Treasurer�Thomas J. Olcott, Esq. Managers�Rev. J. N. Campbell, D. D., Rev. B. Sprague, D. D., Rev. Andrew Yates, D. D., Annanias Piatt, Esq., Rev. Horatio Potter, D. D., Gen. J. A. Dix, Richard V. De Witt, Esq., Joseph Russel, Esq., Rev. W. D. Snodgrass, D. D., George Vail, Esq., Wm. Reid, Esq., Wm. Tracy, Esq., Rev. John W. Fowler, Rev. Moses Chase, Rev. Henry Mandeville, Joshua A. Spencer, Esq., John F. Seymour, Esq., Wm. Olcott, Esq., Rev. David L. Ogden, Rev. Gilbert McMaster, D. D., Rev. Joseph McCarroll, D. D., Rev. Reuben Smith, D. D. Barnard, Esq., Bradford R. Wood, Esq., Wm. C. Miller, Esq. The minutes of the Convention were then read, approved, and ordered to be published; and then the Convention adjourned sine die. Liberia, officially the Republic of Liberia, is a country in West Africa bordered by Sierra Leone to its west, Guinea to its north and Ivory Coast to its east. It covers an area of 111,369 square kilometres (43,000 sq mi) and is home to about 3.7 million people. English is the official language and over thirty indigenous languages are also spoken within the country. Its coastline is composed mostly of mangroves, while its more sparsely populated inland consists of forests opening onto a plateau of drier grasslands. The climate is hot and equatorial, with significant rainfall during the May�October rainy season and harsh harmattan winds the remainder of the year. The country possesses about forty percent of the remaining Upper Guinean rainforest. Liberia is the only country in Africa founded by United States colonization while occupied by native Africans. Beginning in 1820, the region was colonized by African Americans from the United States, most of whom were freed slaves. The colonizers (who later become known as Americo-Liberians) established a new country with the help of the American Colonization Society, a private organization whose leaders thought former slaves would have greater opportunity in Africa. African captives freed from slave ships by the British and Americans were sent there instead of being repatriated to their countries of origin. In 1847, this new country became the Republic of Liberia, establishing a government modeled on that of the United States and naming its capital city Monrovia after James Monroe, the fifth president of the United States and a prominent supporter of the colonization. The colonists and their descendants, known as Americo-Liberians, led the political, social, cultural and economic sectors of the country and ruled the nation for over 130 years as a dominant minority. The country began to modernize in the 1940s following investment by the United States during World War II and economic liberalization under President William Tubman. Liberia was a founding member of the United Nations and the Organization of African Unity. In 1980 a military coup overthrew the Americo-Liberian leadership, marking the beginning of political and economic instability and two successive civil wars. These resulted in the deaths of between 250,000 and 520,000 people and devastated the country's economy. A peace agreement in 2003 led to democratic elections in 2005. Today, Liberia is recovering from the lingering effects of the civil wars and their consequent economic upheaval, but about 85% of the population continue to live below the international poverty line.